"Steve had expressly told me it was totally top secret. He said he was going to fire anyone who tells the world. Tony Fadell was pondering just how he was going to explain to Steve Jobs that he'd lost the prototype of what would become the most successful technology product of all time, the Apple iPhone which launched 10 years ago on Monday. He'd just got off a plane, felt his pockets, and... nothing. "I was walking through every scenario thinking about what could happen," he told me. None of them ended well. After two hours, relief - thanks to the efforts of a search party that didn’t know what it was trying to find. "It fell out of my pocket and it was lodged in between the seats!" Within just a few months, the world would know all about the little device - but for now, Fadell was holding it tight. Tony Fadell is sometimes referred to as the "godfather" of the iPod. He left Apple in 2010, and went on to found Nest, the smart home company now owned by Alphabet, Google’s parent company. He left that company last year*. As far as Fadell is concerned, today is in fact the 12-and-a-half year anniversary of the first iPhone. That’s when he started working on the idea, born out of an acceptance that the iPod, which was turning around Apple’s fortunes, was a platform that could be developed further. By this point the iPod had got video capabilities, even games. "We were like, 'Wait a second, data networks are coming'," he told the BBC. "We should be looking at this as a general purpose platform." Starting this way was the magic ingredient that meant the iPhone broke boundaries, Fadell said. While competitors like Microsoft were trying to shrink the PC into a phone, Apple was looking to grow the iPod into something more sophisticated. Indeed, one early iPhone concept design used the iPod's distinctive click-wheel as its input method. That was soon ditched. "We were turning it into a rotary phone from the sixties," Fadell remembered. "We were like, 'This doesn’t work! It's too hard to use'." It just so happened that in another part of Apple, work had started on a touchscreen Macintosh computer. "They had been working on this in secret. It was the size of a ping pong table. Steve showed it to me and said, 'I want to take that and put it on an iPod'." Fadell warned Jobs that to make a touchscreen device like the one he envisioned would take time, money and new dedicated infrastructure. They went for it. "We needed thousands of people working on all of this, at the same time, for it to land together for the launch. "And then we only had six months after that to ship it. Obviously we pulled it off, but it was not easy." Apple had many of the best brains in the business, but until that point it hadn’t ever made a phone of its own. And so Fadell planned a fact-finding world tour to meet experts and check out research labs of telecoms experts. It began with one manufacturer in Malmo, Sweden - a trip which ended with all of their bags, notes and equipment being stolen from their cars while they were inside a restaurant having dinner. "They knew we were building a phone," Fadell said. "We asked our host where to get to dinner, we were there all of 20 or 30 minutes because we were tired. "When we got back to the car, every single thing in the car was gone. Every single bag. We swear it was corporate espionage." If it was, there were few secrets lost. The team returned home without many of their belongings, but heads full of ideas. Meanwhile, one fiery debate was just getting started. It was of course: Should the iPhone have a keyboard or not? "That fight raged on for around four months," Fadell said. "It was a very ugly situation." Jobs, who had his heart set on a touchscreen, became so incensed with people disagreeing with his ideas that he enforced a blunt policy. A Sunday newspaper columnist described me as having clutched the phone as if it were "a fragment of the true cross", and some viewers complained that the BBC had given undue prominence to a product launch. I appeared on the Newswatch programme to defend our reporting and said that some products did merit coverage because they promised a step change in the way we lived - and I mused on whether the Model T Ford would have been a story if we'd had a TV news bulletin back then. Afterwards, I rather regretted saying that - who knew whether the iPhone would really prove as revolutionary as the arrival of mass car ownership? But today that comparison does not look so outlandish. "Until you can agree with us you can’t come back in this room,"” Fadell recalled Jobs saying to pro-keyboarders. "If you don’t want to be on the team, don’t be on the team." "One person got sent out of the room and everybody got the message and fell in line." But while the argument left the room, it didn’t leave the iPhone team’s minds. Indeed, some people still think it was the wrong decision not to go for a Blackberry-style keyboard which, back then at least, was the phone to beat. "We laid out all the risks of using just a touchscreen. We had to work around each one." From the word go, Jobs was clear: the iPhone didn’t need to work with a stylus because your finger is all you should need. But Fadell told the team working on the multi-touch screen - arguably the greatest breakthrough the iPhone heralded - to make sure it was compatible with a stylus anyway. "I thought, 'We must make this work with a stylus'," Fadell remembered. "Because we knew it was right, even though Steve was making a philosophical point initially saying you can just use your finger. We knew there will come a day when you’re going to need a stylus. "We did it without his knowledge, it was behind the scenes. He would've ripped my head off." Doing things in secret was a common strategy for stubborn engineers and designers who took the view that what Jobs didn’t know couldn't hurt him. And if you were eventually proven right, you could accept the praise. "It was the same thing that happened with the iPod working on a PC," Fadell said. "Steve wanted nothing to do with it, but when iPod growth stalled, we said, 'Oh by the way we've been working on this background'." Jobs may have relented on having Apple products work on Windows, but he took his hatred of the stylus to his grave, though his successor, Tim Cook, introduced the Apple Pencil in 2015. And so to the 9th January 2007. Hordes of fans and media shuffled into San Francisco’s Moscone Center to see what Jobs brought on as his "one more thing" at the end of a keynote address at that year’s Macworld event. 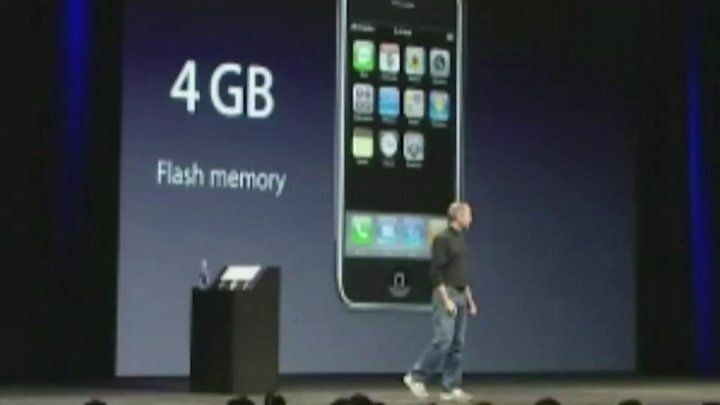 The device on stage was "only half-baked", Fadell recalled, but was quickly referred to as the "Jesus phone". 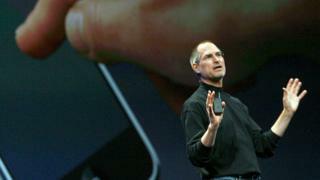 The press mocked the cultish manner in which iPhone was unveiled. Steve Ballmer, at the time Microsoft's chief executive, famously laughed at the device, calling it "not a very good email machine" that wouldn't appeal to business users. "We all laughed at him," Fadell remembered. "We also laughed at Blackberry. Whenever I create a new product , and I learned this with Steve [Jobs], if the incumbents laugh at you and the press laugh at you, you go, 'we’ve hit a nerve'." *The BBC’s interview with Tony Fadell was granted on the condition it was limited to the history of the iPhone and not his work with other companies.